Christina Applegate's breast cancer diagnosis came from an MRI: Why hasn't my doctor recommended one? 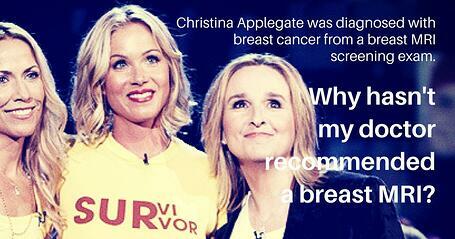 Christina Applegate was diagnosed with breast cancer at the age of 36 after a breast MRI and has been an advocate for the benefits of screening ever since. In particular, she has been very public about her feelings on the need for easier accessibility of advanced breast screening, such as MRI. So if breast MRI is beneficial to the diagnosis of breast cancer, you may be wondering WHY your doctor has not recommended one. Breast MRI is requested by your physician most often in cases where there is an abnormal mammogram or a history of breast cancer in a ‘first-degree’ relative (parent, sibling or child), or a genetic predisposition to breast cancer. It may also be helpful to screen women who have implants or scar tissue that makes reading the mammogram difficult, or to determine if an implant has ruptured. Breast MRI is also meaningful to distinguish between recurrent tumors from radiation or surgical scar tissue. Breast MRI is most important for women diagnosed with breast cancer to determine the extent of the tumor and to assess the possibility of multiple tumors in the same or opposite breast. Breast MRI screening on an annual basis is recommended for women who are at a high-risk for breast cancer. For example, women who have had genetic testing or found to have a mutation that puts them at high risk of developing breast cancer and women with a strong family history of having a mutation or breast cancer. Women who have had breast cancer without a genetic or hereditary predisposition are at moderate risk of reoccurrence and not necessarily a candidate for Breast MRI. Breast MRI is not useful as a primary screening tool for the general population. However, screening is most valuable for high- risk patients and patients with dense breast issue. Here is another scenario for consideration: Your doctor HAS recommended a breast MRI, but your insurance company has declined the authorization for payment. Because a breast MRI is considered investigational, the approval process for the insurance claim is very detailed. Below are some reasons that your insurance claim may not be approved, even if your doctor recommends the exam. Keep in mind that if your physician feels strongly that this test is the best option for you, they can ask the insurance provider for “individual consideration” where they can state the case in more detail for a chance for approval. Source: Blue Cross Blue Shield of Massachusetts for reference only. This list may not be complete for all insurances and does not guarantee approval or payment by the insurance carrier. Shields MRI offers Breast MRI services at 14 locations in our network. Our breast MRI patients are always scanned on our 1.5T high-field or 3T high-field MRI machines – this ensures that the images are of the very highest quality and detail. Shields prices for breast MRI can be up to 60% less than non-partnering hospitals and offer the very highest quality. We hope that you’ll consider having your breast MRI at a Shields facility.